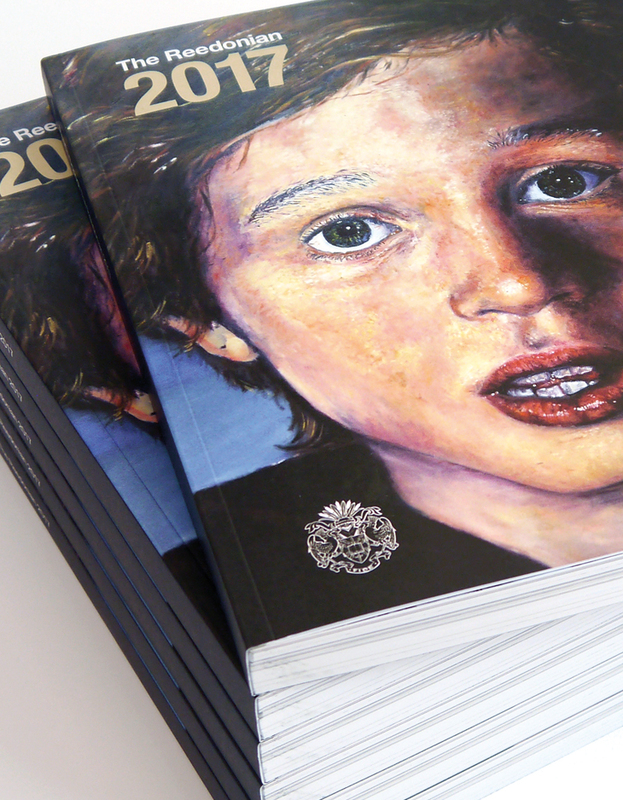 A bumper publication that encapsulates a year in the life of the Latymer Upper School. 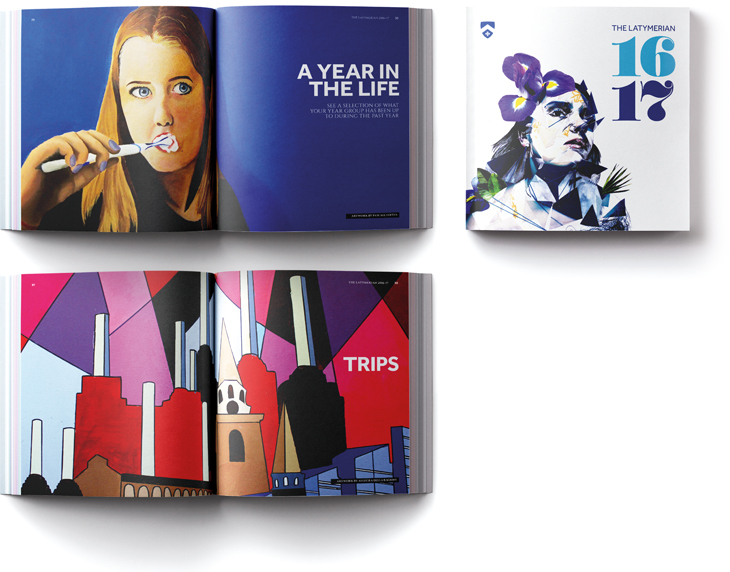 Student artwork is featured on the cover and all section dividers to create a visually compelling read. A thoroughly comprehensive review of the school year showcasing every aspect of life at Reed’s School, Cobham. Brochure to launch the new Master’s educational vision, the Wellington Identity. The Identity is what they want Wellingtonians to be – the skills with which they want to equip students during their time at the College, so that when they leave they realise that their learning journey has just begun. Inspired, interested and engaged students lead happier and more fulfilled lives. The launch issue of KA News - the newspaper for a new, overarching, King’s College School, Wimbledon society of all former boys and girls, staff and parents. 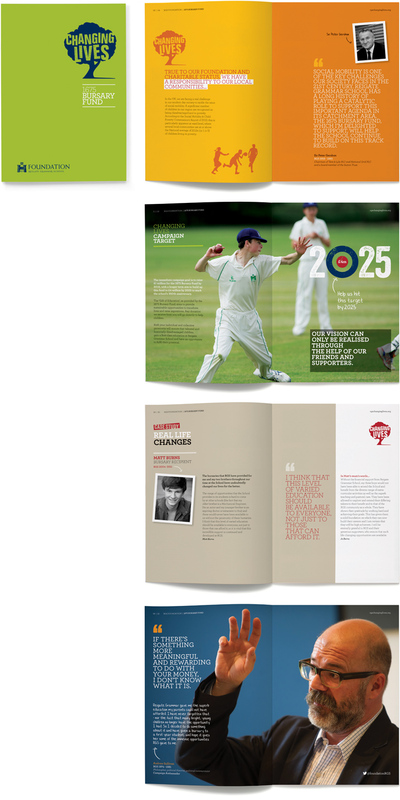 Changing Lives campaign brochure to raise money for the 1675 Bursary Fund which aims to enrich young people’s lives by offering the life changing opportunities that come through an RGS education. 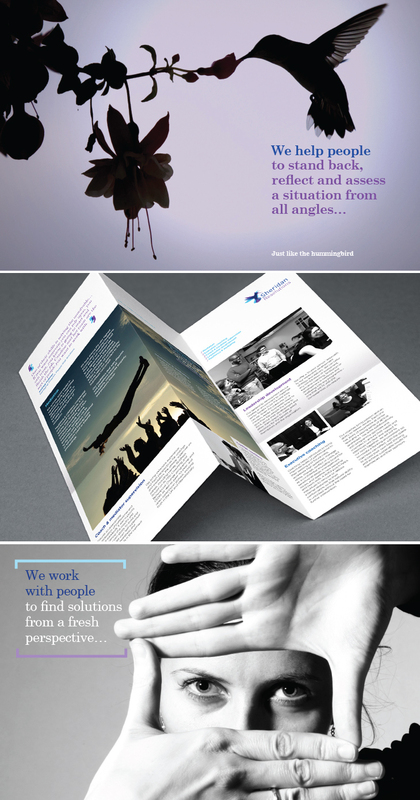 Special fold brochure for Sheridan who work with businesses to provide mediation, executive coaching and leadership development. The brochure cleverly unfolds to a broadsheet format to reflect the way in which they approach a situation from all angles. 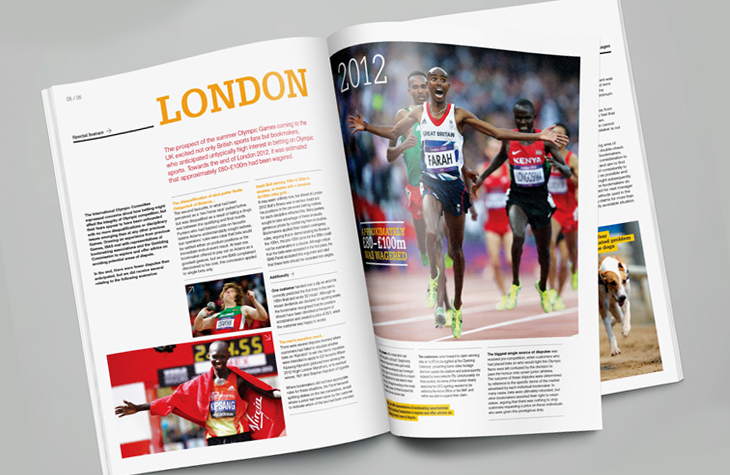 Annual Report & Accounts for IBAS (Independent Betting Adjudication Service) with a strong focus on betting disputes at the Olympics. IBAS acts as an impartial adjudicator on disputes that arise between betting/gambling operators and their customers after they have been through the operator\'s own internal dispute procedures and if a deadlock exists. 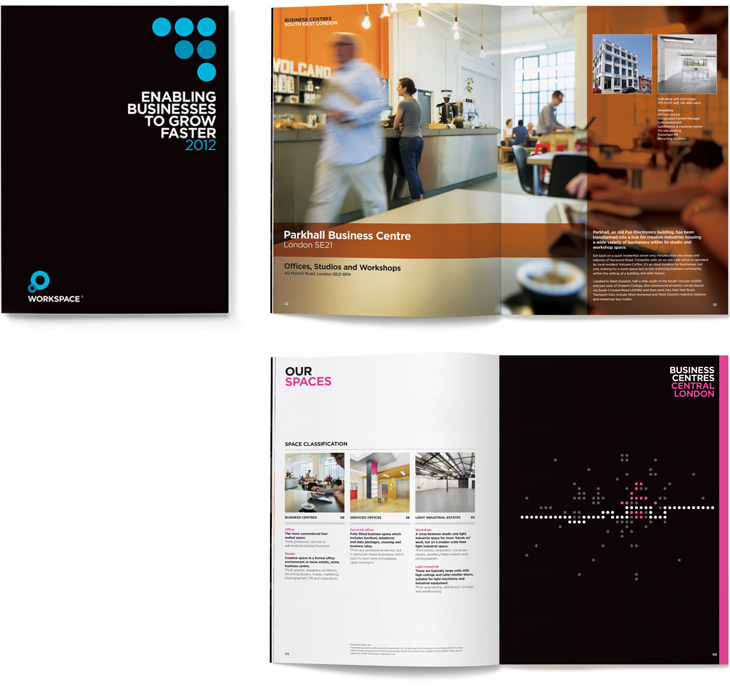 Annual sales brochure as part of the rebrand for Workspace. It’s a comprehensive 108pp guide to the company and what it has to offer SMEs. It features customer case studies, business advice, full details of all their products and services, plus an extensive listing of their property portfolio. A series of marketing materials for UKFT (UK Fashion & Textile Association) to highlight British designers at international trade shows. The Union Jack element is distinctly British and creates a flexible colour coded device to use across the multiple disciplines of the fashion and textile industry, for any destination around the globe. 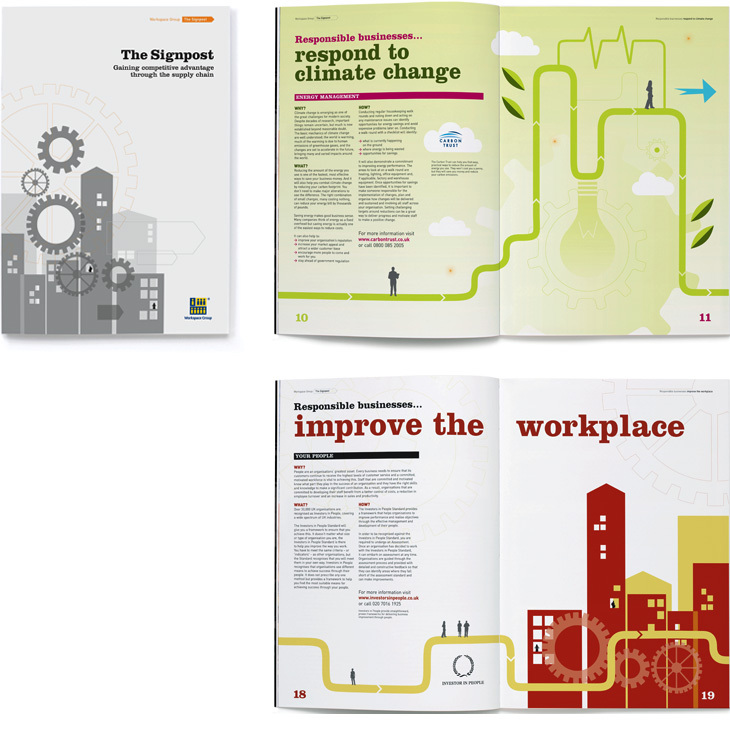 Brochure for an initiative by Workspace Group, the largest provider of good value, small unit accommodation for SMEs throughout London. The Signpost points their suppliers and customers in the right direction for help and assistance on all key aspects of sustainability. NB's mission is to cut through the hype and seek out the truth in travel. What's new, what's not, what has the "x" factor - what hasn't. Nota Bene is independent and impartial - the insider's travel review. Subscribers enjoy 10 beautifully designed destination reviews each year as well as online access to over 30 regularly updated back issues. Flagship private banking brochure, describing Arab Bank's global wealth management to clients and prospects around the world. Identity and brochure to assist with the sale of this most magnificent and stylish property at 11 Brick Street, Mayfair. Seven different metallics, five different stocks, throw-out sections and stunning photography, all housed in a maccassar ebony slipcase. This set of direct mail postcards for Waitrose set out to inform the consumer of their commitment to the smaller supplier and to local, regional produce. Each product featured is specific to the region and is produced within 30 miles of the Waitrose branch in which it is sold. The role of the Foreign & Commonwealth Office Information Department is to promote Britain and British interests abroad, and to help achieve this the department produces a whole range of high quality publications. They all highlight various different aspects of the British way of life, its people, history, culture and commerce. 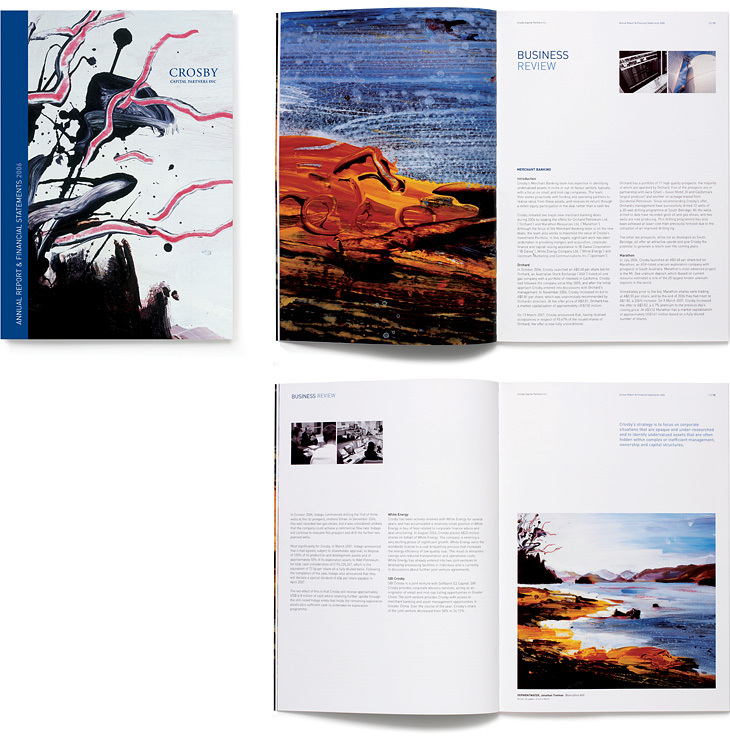 This brochure promotes contemporary crafts in Britain as a hugely talented and thriving industry. Situated in Chancery Lane, WC2 - right in the heartland of the legal profession - Quality Court offers high specification, fully serviced office accommodation. 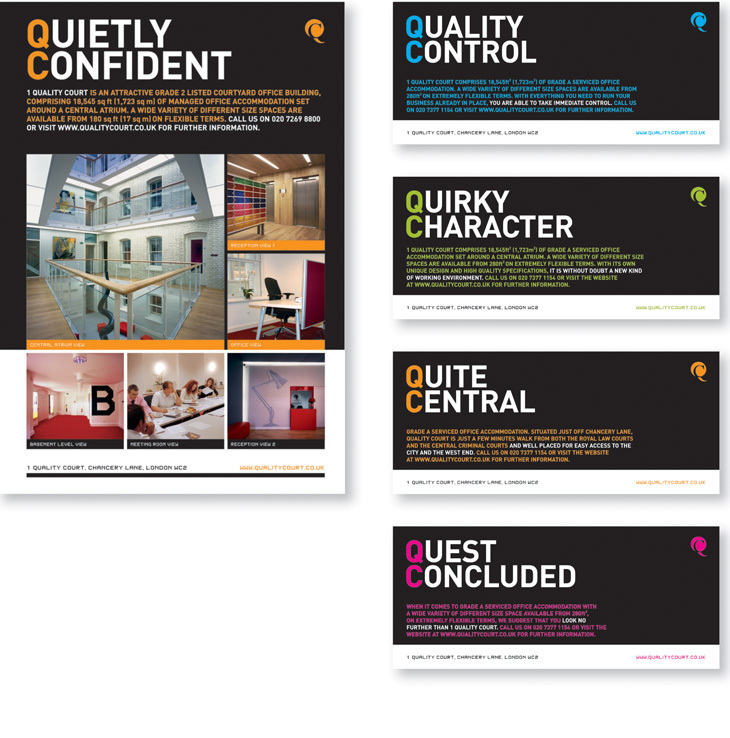 We quickly picked up on the 'QC' concept and produced a whole range of information and marketing collateral to promote this unique working environment to would-be customers. Pre-sales marketing pack for the launch of this luxury private members health club in Chelsea. A start-up consultancy specialising in the strategic recruitment of senior executives. The partners, Messrs Smith and Bull wanted the company to have a young and dynamic feel. 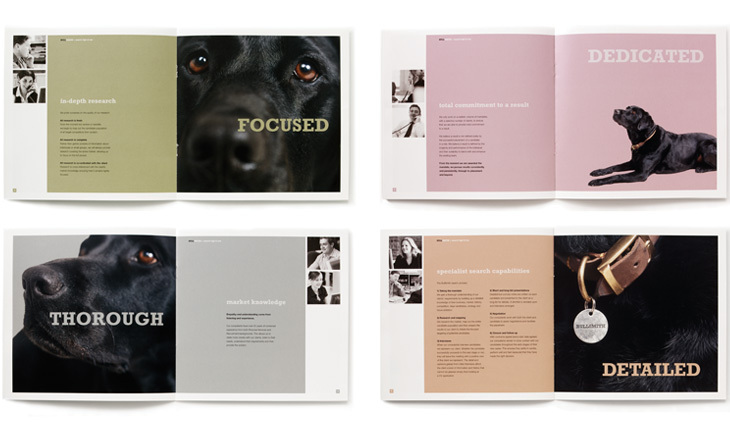 Our proposal to use a black labrador sniffer dog, and call him BullSmith, gives them a friendly and unique sales brochure that sets them apart in a fiercely competitive market, and at the same time illustrates their work ethic and individual approach. The brief was simple - to promote WaitroseDeliver as ‘the best’ online grocery shopping service. The combination of internet icons and witty ‘calls to action’ proved to be the recipe for success in creating customer awareness across the southeast of England. As the largest provider of good value, small unit accommodation for SMEs throughout London, Workspace are naturally keen to demonstrate a continued commitment to corporate and social responsibility. The Workspace corporate colour scheme provided the inspiration for the creative solution - a visually strong campaign of clear and simple 'green' messages for the workplace. Campaign designed to promote the flexibility of Workspace’s leases, allowing customers to move quickly and easily between their business centres. Designer Collection brochure, part of the brand re-positioning project for Brockway Carpets. The UK's largest charity working with and for older people asked us to design and produce all the promotional materials for their annual awareness campaign 'Your Rights' week. The nationwide campaign is designed to encourage older people to claim all the benefits to which they are entitled. Annual Report & Accounts for a leading independent, deal-focused, Asia-orientated merchant banking and asset management group. Crosby’s strategy is to focus on corporate situations that are opaque and under-researched and to identify undervalued assets that are often hidden within complex or inefficient management, ownership and capital structures. The annual report reflects this strategy by using progressive sections of an original painting until the whole picture becomes clear.